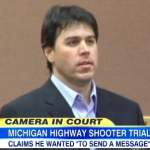 Dan appeared on Good Morning America on Tuesday, January 28th to discuss a man from Michigan who is accused of 23 highway shootings. He is taking the stand in his own defense claiming that demons haunted him and using mental illness as a defense. Says Dan, “He’s in a tough spot because under Michigan law, it’s all or nothing, meaning you either plead the insanity defense, and you say ‘ I didn’t understand right from wrong’ or you go for not guilty. He seems to be going for something in between, which is to say I’m not going to go for the insanity defense because I understood what I was doing was wrong but I still was mentally ill. That’s not under the law a defense in Michigan. It used to be, something called diminished capacity where you seek to get a lesser conviction. Not a valid defense under the law at this point he’s hoping for the sympathy of the jury.” Watch the full clip here.